Great looking New Zealand replica/souvenir cycling jersey in a women's specific fit. Full length zip, three pockets plus additional fourth zipped pocket with reflective piping. Tineli clothing is designed to be a race fit. 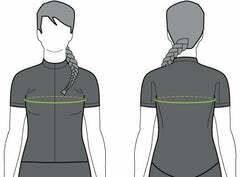 If you prefer a more relaxed fit choose a size larger than the sizing chart indicates. Shop with confidence, if you're not completely happy with your purchase simply return it to us in new condition for a full refund, or to swap for a different size - no questions asked.